The third volume of Pierre Nora's monumental work documenting the history and culture of France turns to French manners, mores, and society. 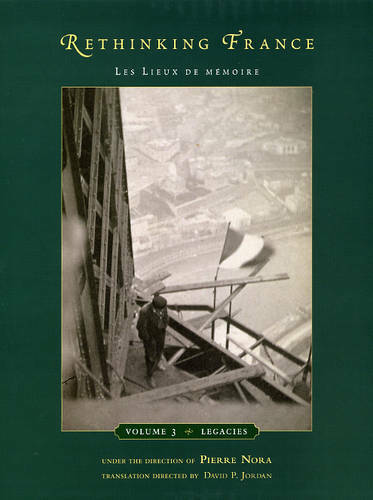 While previous volumes focused on specific historical events, people, and institutions within France, the essays in "Legacies" are concerned with the kinds of things that make up the heart of French culture: conversation, cafes, songs, wine, gallantry, and places imbued with national symbolism such as Notre Dame and Sacre Coeur cathedrals. Linking these diverse topics together is the idea of patrimony - a term used by the French to designate the collective culture of the country or its national heritage - a concept that has undergone radical changes beginning with the Revolution and corresponding to other dramatic ruptures throughout France's history. As a whole, these twelve essays by leading French historians add up to an illuminating and well-rounded portrait of those cherished traditions that together form the basic foundation for the distinctive culture of the French.